Water is always my first drink of choice to stay hydrated, but there are the times when you just feel like something a little different. There are also those times when you are out socialising and you want to take something nice to drink that isn’t alcohol. So many drinks are packed with sugar, but something that is refreshing, tasty and much lower in sugar than fruit juice is coconut water. It contains about half the sugar of juice, and also provides some potassium. It makes the perfect base for mocktails, and adds a lovely flavour to nourishing green smoothies. Recently I was sent some CoAqua coconut water to try out and it is really delicious. Their coconut water is from Vietnam, taken from young coconuts at 6 months and you can actually taste the difference between this and other brands (I didn’t believe it would taste different, but it does!). It tastes really fresh and has an amazing, pure coconut taste that I’ve been enjoying. I like that it also comes in recyclable bottles and nice slimline cans which are the perfect measure for making drinks and smoothies. 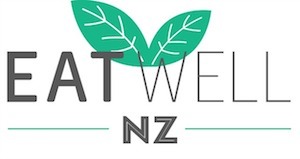 You can find this brand at New World Supermarkets and Farro Fresh. 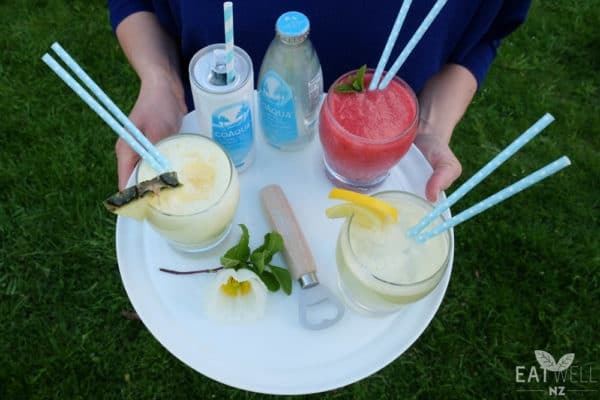 I’ve been experimenting with some new drinks and today I’m sharing with you a couple of my favourite simple coconut water based drinks – firstly the best ever tropical green smoothie and some ‘mocktail’ type drinks which are great for summer entertaining or a refreshing drink on a warm evening. I’m a bit particular when it comes to green smoothies – if I’m going to be drinking my greens, I also want them to be tasting good too. I’ve had some horrible green smoothie combinations, but this smoothie is a goodie! It’s a yummy way to boost your fruit and vegetable intake for the day. Since being on maternity leave, I’ve been enjoying this regularly as an afternoon drink as it’s refreshing, tasty and hydrating plus it’s an easy way to get an extra serve of fruit and vegetables in my diet. 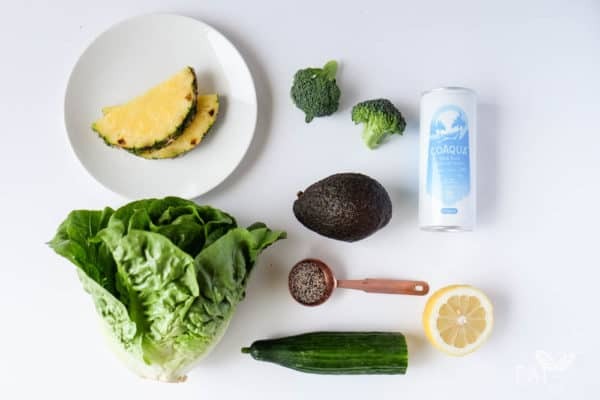 The pineapple and coconut water are all that are needed to give this a yummy flavour, the vegetables added don’t have a strong flavour and the avocado adds a delicious creaminess. To make: simply place all the ingredients in the blender and blend until smooth. 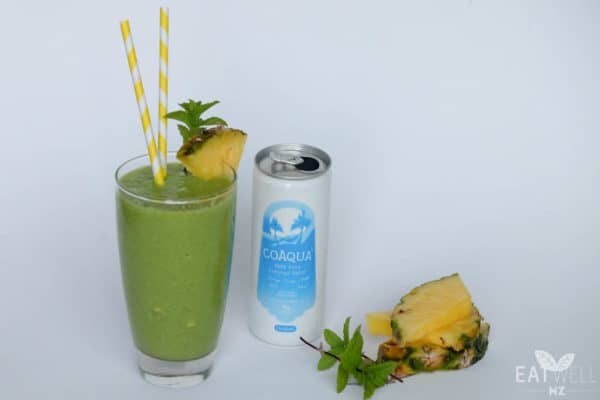 The CoAqua drinks taste great by themselves, but they’re also delicious blended with some fresh fruit to create fruity ‘mocktails’. My favourite is the cranberry and mango – frozen cranberries taste amazing and are also a source of Vitamin C and high in antioxidants. These are the perfect Friday night drink to relax with and are super simple to make too. Here’s the recipes. To create the drinks, simply blend together ingredients in a blender until smooth. Garnish with fresh fruit and herbs. These all make one serve, but you can double, triple the recipe etc as required if you have guests. I’m giving away a case of the new slimline CoAqua cans. That’s 24 cans so you can try CoAqua and whip up some of these recipes for yourself. To be into win, comment below with what recipe you think you’d try out. Winner will be drawn November 25th and notified via email. Their name will also be published on this post. Open to NZ entries only. This post was made possible thanks to CoAqua. I would try all 3 fruity smoothies, they sound so delicious. the very first one would be Mango and Cranberry as I have frozen mango in my freezer. Your green smoothie recipe sounds great – I’m keen to try it! Lemon, lime and passionfruit would be my choice! Lemon lime and passion fruit sounds delish! Cranberry and Mango sounds like a great mocktail creation to me! Lemon lime and passion fruit sounds delicious! Yum definitely the green smoothie! Such a good way to get more goodness in during the day! Lemon, Lime and Passionfruit. My daughter and I would both love to try. So refreshing. CoAqua is actually amazing right, I wasn’t expecting it to taste different either but I really loved it! Love your mocktail ideas too! Cranberry and mango sounds a great combo to try. Mmmm coconut and pineapple please ???? Cranberry and mango for me for sure, simple and refreshing. Makes me feel like making a smoothie now.. Lemon, lime and passion fruit 100%! Sounds so refreshing. Coconut & pineapple cause I love pineapple. I would try cranberry and mango. The Coconut and pineapple sounds perfect!!! I’m really keen to try the tropical green smoothie, I love avocado in smoothies but haven’t yet tried broccoli. I’m partial to lemon, lime & bitters – so I’d have to say I’d love to try Lemon Lime & Passionfruit thanks ???? Coconut and pineapple – the thought of it is making my mouth water….yum!!! Coconut and pineapple! Will be a reminder of faraway island holidays! The lemon lime and passionfruit sounds so good!!!! Lemon Lime and Passionfruit sounds delish! cranberry and mango sounds awesome!!! Yum coconut and pineapple sounds great to me! Cocount and pineapple sounds delicious to try. Yum! I’d love to try cranberry and mango – 2 of my favourite fruits together which I’d never thought to do before! They all sound great but i would try the pineapple and coconut one first ???? Coconut and pineapple sounds yummy!! Tropical green smoothie sounds good. Cranberry and manga sounds pretty good ???? I’m going to try them all!!!! Gosh it’s hard to choose one as they all sound fab. Maybe the pineapple one first …. But seriously I’m trying them all. Lemon, lime and passionfruit sounds delicious yum yum! I would love to try the tropical green smoothie! I would love to try out your coconut and pineapple! It sounds so refreshing for a hot day! they all sound pretty amazing! I’ll try the cranberry mango one, that’s a bit different! I would love to try Lemon, lime and passion fruit ???? Yummy! Lemon lime and passionfruit! ???? Lemon lime and passionfruit sounds amazing. That would be so refreshing especially after exercise. Actually I think I changed my mind. Coconut and pineapple! That takes me back to island drinks by the water. I really would like to try the coconut and pineapple ! ohhh they all look so yummy!! would be amazing for me and my baby! ( breastfeeding ) haha???? ohhh but ild get so addicted to cranberrie and mango!! yum! ?? I make similar recipes all the time for my smoothies/drinks but have never used CoAqua before. I’d love to try the coconut and pineapple however! I would definitely make the lemon, lime and passion fruit. It sounds so refreshing! They all looks so good! But I think first up I would try the cranberry and mango, yummmmmmm… but of course I would try all of them! I’m going to try the green smoothie like the idea of this as alternative to my usual cup of tea mid afternoon. Great to get some non alcholic drink suggestions that are lower I’m sugar too. Yum they all sound good but the coconut & pineapple would definitely be my go to! ???? I love that coconut / pineapple combo so would live to try that one out but they all sound delish. Oh lemon lime & passionfruit sounds yum! Lemon lime and passion fruit sounds amazing, if I won I think I’d serve these up as the non alcoholic option at our upcoming beach wedding ???? ? Coconut and pineapple for me, it sounds so tropical and yummy…. I’d definitely try out the coconut and pineapple ???? !!! Yum!!! I need to get my extra serves into my pregnancy too! I’d definitely give the coconut and pineapple one a go sounds delish!! Lemon, Lime, and Passionfruit ! Sounds bea u ti ful ! !